It’s that time again! Our end of month round-up of everything that’s caught our attention here at Agents of Field HQ recently. Firstly, flowers. What blooms are doing well in your gardens just now? Our cyclamen are looking fantastic but the sunflowers are starting to look a little worse for wear. Ade took this slightly eerie shot of one up on the allotment which I rather like. It’s how a sunflower would look in a Tim Burton animation about killer sunflowers. Secondly, food. Big shout out to the lovely Sue over at Backlane Notebook who recommended this scrummy recipe for marrows. Who knew marrows could be whipped into jam? I made a batch at the start of the month on Sue’s recommendation, and we’ve just opened the first jar. It’s delicious, more like a marmalade than a jam really, and is absolutely scrummy on hot, buttered toast! Now, Ade and I love a good farm shop, and we were fortunate enough to stumble upon Low Sizergh Barn when we were up in the Lake District at the weekend. Aside from the excellent shop which has a dizzying array of home-made cakes and bakes and jams and chutneys and everything else besides (I’m actually scoffing some of their delicious carrot cake as I type), it has a charming craft gallery and tea-room. Definitely worth a visit should you find yourself near Kendal. Finally, this month taught us all about the peculiar tree goats of Morocco. And let’s not forget Chris, the record-breaking sheep. Anyway, happy end-of-September everyone! Drop us a line here if you have any links you’d like us to include in our end of month round-up for October. Thanks for linking and so glad you liked the marrow and ginger jam. Love the goat and sheep stories!! Yummy! 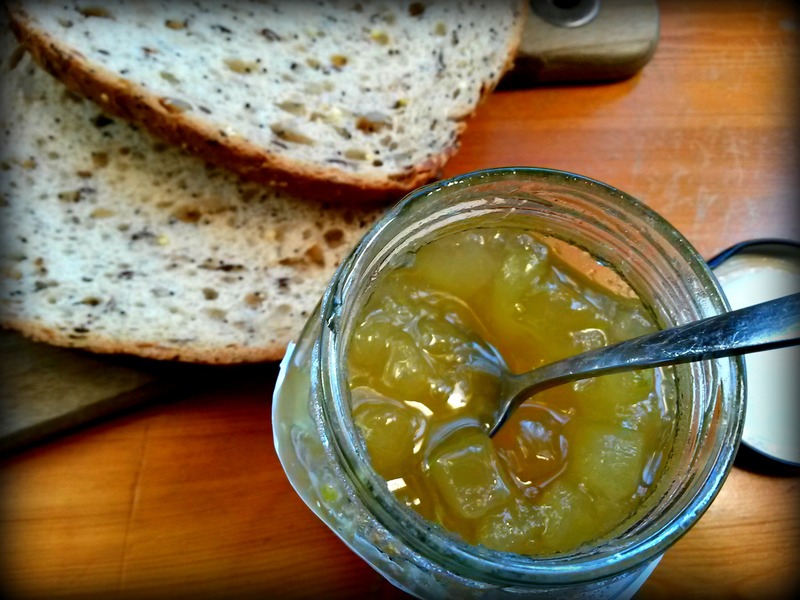 Sounds delicious (and looks delicious too)… what difference is made between marmelade and jam? Is it a consistency or an ingredient thing? (or a cooking process maybe???) Yes, I know, probably a very frenchy question ha ha THANKS for your answer! Good question! And one I don’t have a definitive answer for! I think the main difference is that marmalades tend to use citrus fruit. There are lemons in this recipe so it lends the preserve a more marmalade-y taste. Hope that helps!